From Americana to rockability, from bluegrass to the pop crossover of Taylor Swift, country music has never been more popular. This week BBC Radio 2, together with Chris Country, visits the C2C: Country to Country festival at the O2 and the digital pop-up station Radio 2 Country can be heard from the 9th to 12th. US radio is flooded with country music stations - about 2,000 in all - that can trace their genesis back to station WSM's Barn Dance in October 1925, almost immediately renamed the Grand Ole Opry. WSM still broadcasts the Grand Ole Opry on Tuesday, Friday and Saturday nights. The Grand Ole Opry started by featuring what was generally termed 'hillbilly music', a fusion of folk and bluegrass with a bit of gospel thrown in. It was hillbilly music that started to be heard over the Atlantic on BBC radio in the late 1930s when shows such as Hill-Billy Round Up, The Rocky Mountaineers and Cabin in the Hills with 'Big Bill Campbell' were heard. This Canadian entertainer was perhaps the first person to popularise the American music form in the UK. In the Radio Times of 4 June 1940 we are told that "he has a terrific library of Hill-Billy songs - around 6,000 - and his friends in Canada keep sending him more. He used to broadcast a lot in Canada and the States and came over on a holiday in 1934. He went to see Eric Maschwitz, then Director of Variety, and Eric invited him to compere an All-American Variety programme. Within a year Big Bill had produced on the air the first Rocky Mountaineers programme, which was to bring him fame". Big Bill Campbell, real name Clarence Church Campbell - who often declared the music to be "mighty fine, mighty fine" and would close with "the clock on the wall says it's time to go home" - continued to broadcast on both Radio Luxembourg and BBC radio until his death in 1952. 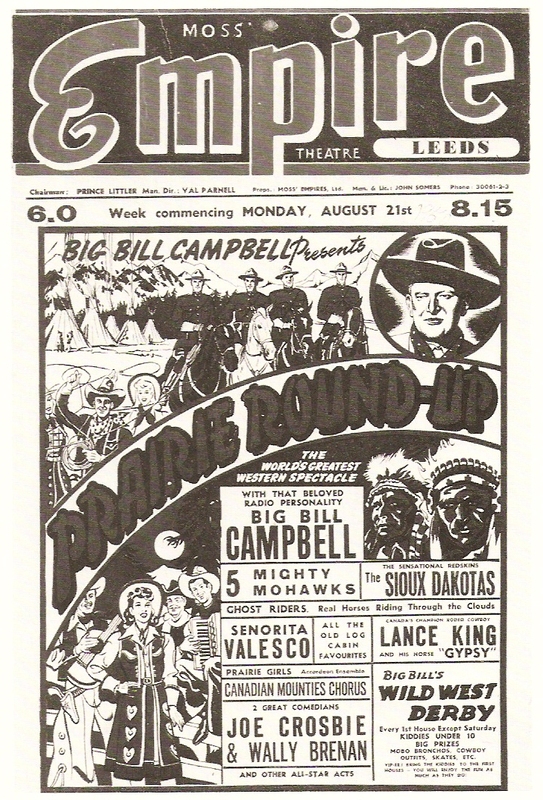 His BBC programmes included the popular Rocky Mountain Rhythm (1940-49) featuring "old log-cabin favourites" followed by the similar Prairie Round-Up (1950). Meanwhile wartime listeners could enjoy National Barn Dance (1943-44) on the Forces Programme and, very much adopting the then popular cowboy persona, shows such as Home on the Range (1942-46) and The Call of the West (1939-46). In 1949 BBC producer Charles Chilton was using the music of the Wild West in a fictionalised story of cowboy Jeff Arnold, played by Paul Carpenter, called Riders of the Range (1949-1953). Such was the success of the series that it spawned its own comic strip in the Eagle. Chilton's other production from that year was Hill-Billy Hoe-Down introducing "the folks of Smoky Mountain". Music for dancing, in the form of square dancing, featured in the programme Happy Hoe-Down (1950-53) with music from Phil Cardew's Cornhuskers. But this was no American outfit, Phil came from Wimbledon and had played in Jack Hylton's band. The next broadcaster to appear on the scene is yet another Canadian, this time Toronto-born DJ and actor Murray Kash. Born in 1923 he'd pursued a career as both an actor, initially in the theatre but later on TV and film - look out for him the next time Thunderball gets a showing - and as a DJ with the Canadian Broadcasting Corporation. Arriving in the UK in 1955 he was initially in rep but picked up some minor film roles and began to appear in radio and TV dramas, both on the BBC and ITV. However, in late 1957 the BBC Home Service offered him a record show called Hill-Billy Hoe-Down which led to further shows in 1958 and 1959. 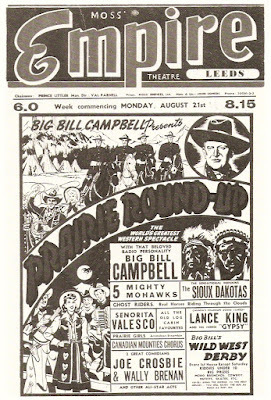 In 1960, by now on the Light Programme, Kash's Hoe-Down shows are now billed as featuring "country and western music". Throughout the 1960s he was the go-to person for country music shows on the BBC, Radio Luxembourg and British Forces Network. 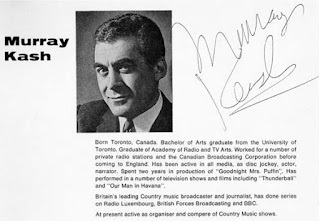 On the Light Programme Murray Kash popped up on Sweet Dreams (1961) and Fine 'n' Dandy (1962), meaning it wasn't all country music, but was mainly introducing country and western records on Twelve O'Clock Spin (1962 & 1964). Walk Right In (1963 & 1965), On the Trail (1963), It's Kinda Folksy (1965-66) which "served up a lunchtime menu of folk and country music" and Call It Country Style (1966-67). Kash continued to organise and promote live country music shows but still made some radio appearances until 1971 reviewing records and providing the latest country music news on Country Meets Folk and Country Style. National radio got its first regular country music show in the summer of 1967, although it had to share the hour with folk music. Country Meets Folk, running for five years on the Light Programme, then Radio 1 and Radio 2, (and often simulcast on BFBS radio) blended records, live performances and reviews of new releases and pretty much set the template for radio country music shows. Country Meets Folk's presenter was Wally Whyton, already known to radio listeners for his skiffle performances with his group The Vipers. He'd also had a go at presenting on Folk Room (1965). In fact Wally's biggest fan base was probably amongst the children of Britain who'd seen him every week between 1959 and 1966 on ITV's teatime show The Musical Box as well as Huff Puff Junction and Five O'Clock Club where he created the puppet characters Pussycat Willum and Olly Beak. Such was Wally's connection with a younger audience that he presented Play School for a while and was deputising for Ed Stewart on Junior Choice in the 1970s. This edition of Country Meets Folk, recorded at the Playhouse Theatre in London, comes from either 1969 or 1970. Thank you to Chris Brady. This edition dates from 20 May 1972 and was recorded by Barry Alan Shaw who regularly attended the recordings that year. 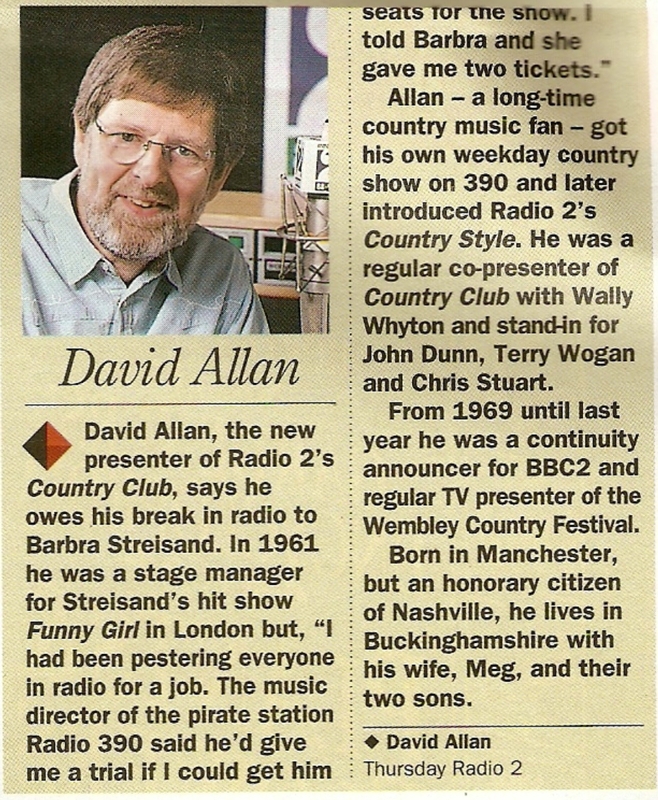 The next name in the story is David Allan who presented a new show, Country Style, on Radio 2 from March 1968. David would become the voice of country music broadcasting on radio and TV for the next three decades. He'd started off on the offshore pirate 'sweet music' station Radio 390 where he also devised a country music show. David left Country Style in 1969 to concentrate on TV continuity work for BBC1 and BBC2, a role he maintained until 1994. He was replaced by Pat Campbell, another performer turned broadcaster. Irish-born Pat had been part of the singing group The Four Ramblers, a group that Val Doonican was in for a while. He became a promotions manager for RCA Records but also started to broadcast both for the BBC and Radio Luxembourg. On the Light Programme he'd filled in for Brain Matthew on Saturday Club, hosted Ring-a-Ding-Ding (1962) and over on BBC2 introduced the acts on The Beat Room - a series for which only show has survived. 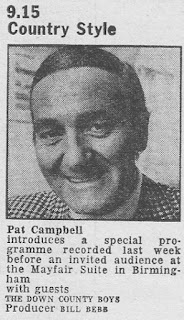 Pat continued as presenter of Country Style until the end of its run in June 1973. David Allan was back on Radio 2 in September 1972 for the series Up Country, following him, until it ended in 1974, were Dave Cash and Pete Brady. This short clip with Pete Brady dates from 1973. David Allan meanwhile was back on Radio 2 in January 1980 with the record show Country Style (1980-82), running for 30 minutes on a Sunday afternoon and later getting a full hour on Saturday evening. He then introduced Country Greats In Concert (1982-83). This recording of Country Style dates from 15 March 1981. From 3 February 1980 comes this recording courtesy of Noel Tyrrel. Moving away from national radio for a moment I mustn't forget that local radio, as many BBC and ILR stations used to devote an hour or so a week to country music. Growing up in East Yorkshire I well recall Radio Humberside's country music presenter Tex Milne, followed later by Tammy Cline and Bob Preedy. Until his death last year Dave Cash presented a country music show on Radio Kent and one of the best of the current crop is Steve Cherelle on BBC Essex. Nearly all the early ILR stations started off with country shows but the longest running is, of course, Downtown Country with Big T, still on the air 40 years later. So popular is country music in Northern Ireland that Downtown launched a DAB spin-off station Downtown Country in 2015. In the 1980s Metro Radio had a country music programme presented by Brian Clough, known for a while as The Friday Night Country Crowd. Brian was also heard on Radio Tees and later Great North Radio, Radio Newcastle and Smooth Radio. These days his The American Connection Country Show is on Radio Tyneside. Radio Cumbria's Paul Braithwaite, with the station since 1972, also has a weekly Braithwaite's Country programme. Country-only stations are rare in the UK: in London there was the AM station Country 1035 (David Allan was an early presenter), the short-lived Clyde spin-off 3C and CMR, (Country Music Radio), a sister station of QEFM, broadcasting via satellite in the 1990s which still has an online presence as CMR Nashville with the original owner and DJ Lee Williams. More recently there's Chris Country which has DAB and DAB+ coverage in a number of regions. The new kid on the block in 1992 was Nick Barraclough. Country music was breaking through to the mainstream with artists like Garth Brooks and Mary Chapin Carpenter and his show, Nick Barraclough's New Country, reflected that. Nick had been a folk musician in the 1970s but started to broadcast in the early 1980s on his local station BBC Radio Cambridgeshire as well as introducing the Cambridge Folk Festival coverage on BBC2. He moved into radio production, working on a number of music documentaries for Radio 2 and joining the team of producers for Gloria Hunniford's show. He worked on programmes as musically diverse as Country Club and Alan Keith's The Golden Years. Running from 1992 to 2007 New Country was an independent production from Smooth Operations, a company of which Nick was a director. This short clip is from the 1990s, I seem to have mislaid the exact date. When Wally Whyton left Radio 2 in 1995 David Allan was back in the hot seat on Country Club. In January 1997 he had the sad task of informing listeners of Wally's death. Here's part of that show from 24 January. 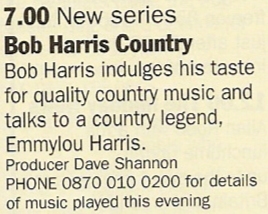 Bob Harris had always played country music on his Radio 1 and Radio 2 shows but it was still a surprise when network controller Jim Moir asked him to present a show dedicated to the genre, to "explore the fringes of mainstream and unearth the new artists who were going to take the music forward". 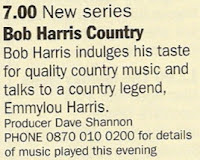 Bob Harris Country launched on 8 April 1999 and, of course, remains on air to this day, the station's only regular country show. In this special edition from 21 October 2010 Bob talks to Mary Chapin Carpenter.